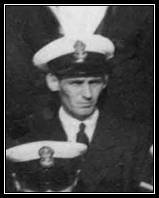 Petty Officer James (Jim) McKean was born on 17.May 1912 in Blyth, Northumberland. He joined the Royal Navy in 1940, served on HMS Hyacinth (British Flower Class Corvette) which was engaged for defence of convoys and anti-submarine operations between Alexandria and Tobruk. 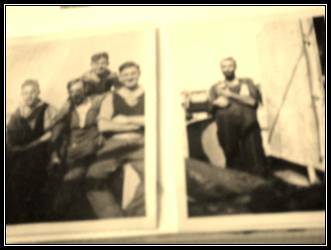 Jim went on to serve on HMS Scarab (Insect Class River Gunboat) as Petty Officer (Engine Room). He served on HMS Scarab from 24 October 1943 to 4 August 1944. In October 2010 an email was received from the daughter of James McKean, Petty Officer (Engine Room) on Scarab. Ann Simonson who lives in Norway. “I have that group photo. My Father was on the third row, 6th from the left. I have another group photo of the officers. Strange to see this photo on the internet. Christmas Card 1943 (picture of Scarab) and Jim’s greetings to his wife and baby Ann. Written on the back of the card Ann’s Mum wrote “Jim arrived home from the Mediterranean September 3rd 1944 and from the Pacific January 5th 1946. 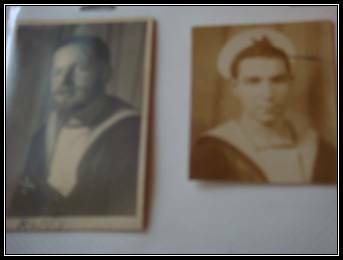 Seems like Dad served on several ships. I had always heard that as well. I don’t know any details of the other ships. My dad didn’t speak much about the war years, he was awarded some medals but refused to collect them, why I do not know. As I live in Norway I have learned a bit about when they were occupied during the war and the bravery of the people. My daughter-in-law’s grandmother was sent to Germany to a labour camp and was there for years. Her husband and other members of her family were executed in Finnmark, Norway. She wrote a book about it a few years before she died. I had 2 uncles on my mother’s side also in the navy. 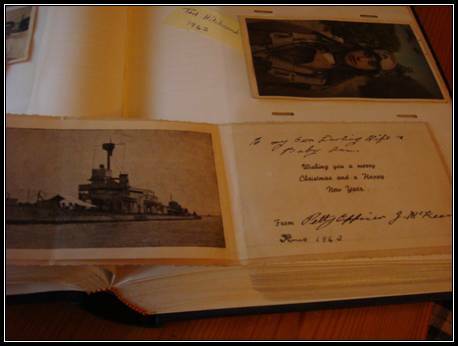 A Christmas card from one of them from 1945 (HMS Colossus). Also 2 Uncles in the army and 3 in the Air Force. One Uncle was shot down over Germany and is buried there, another uncle was in the army and was shot in Holland and is buried there. Wars are dreadful but it seems like the human race never learns. And crew member (right) with Jenny the monkey. Apple pie - custard &c.
Peaches - pears - jelly &c.